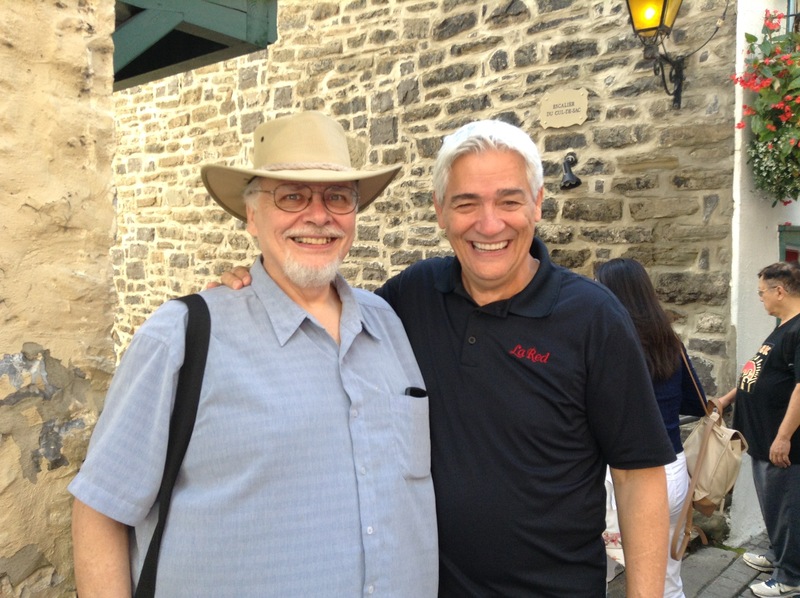 On to Quebec City – it feels like we’ve crossed over into a new country! All the signs are in French and everyone is speaking French – it’s a good thing I have my very own Frenchman to get us around. 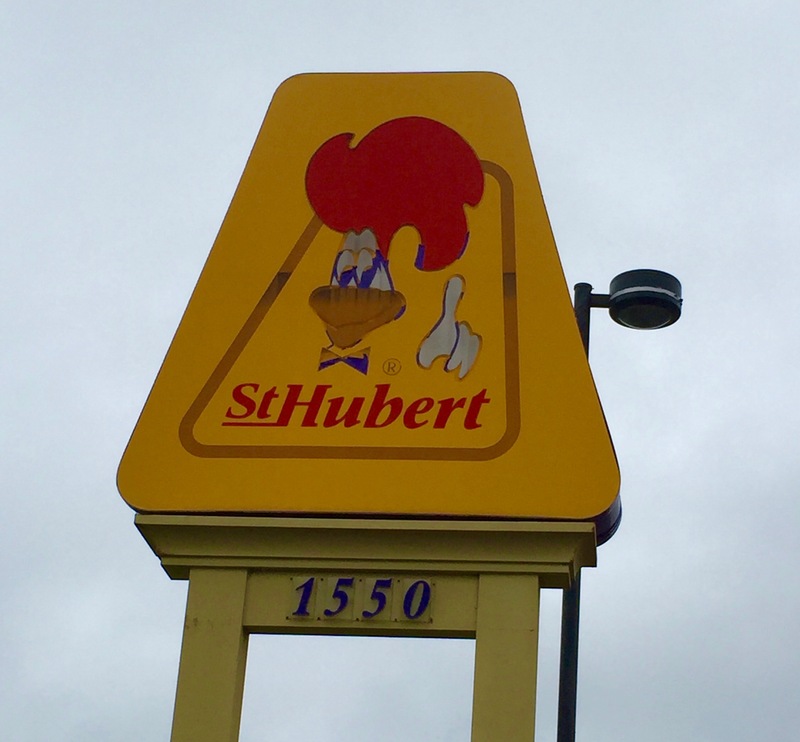 🙂 We went to St. Huberts for dinner – a chicken place similar to Swiss Chalet but only found in Quebec. We were going to go see a movie but they were all in French! We needed an early night anyway. Don, a friend of Mike’s who lives there, met us the next day and showed us around the old city. What a quaint picturesque place! Reminds me very much of France. There was also the Grand Prix Cycle Race going on through the narrow streets of the city, amazing how fast they are going, even up hill! The circuit was done 16 times and most of it was up and down very steep hills. Outside the walls of the old city the older buildings continue. Most have been restored and are restaurants, businesses or condos. 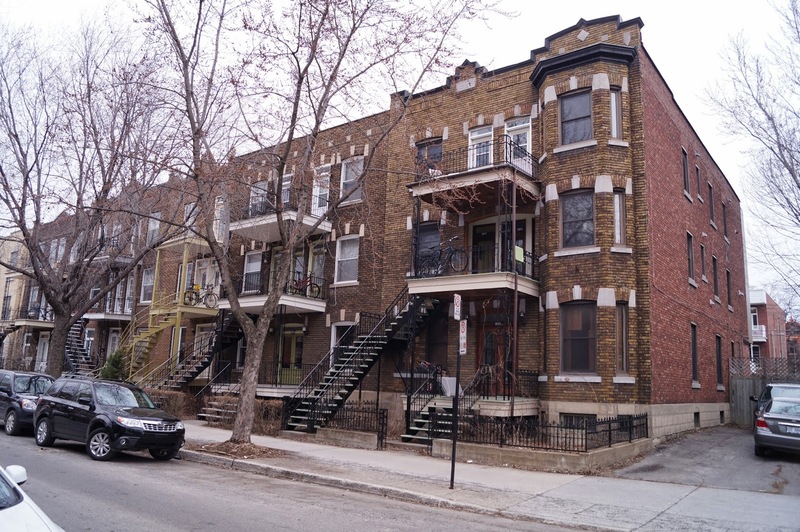 A trademark of Quebec in both Montreal and Quebec City are the 3 and 4 story apartment buildings. There are stairs on the outside that lead to the 2nd floor and then stairs on the inside to the 3rd or 4th floor. There are rows and rows of these brick buildings, bringing back memories for Mike of the several he lived in as a child. 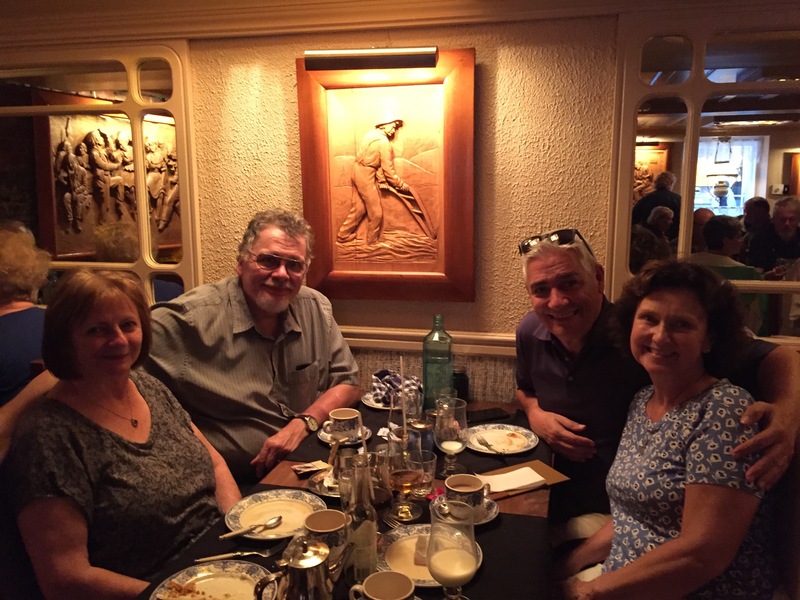 The next day Marjorie, Don’s wife joined us and we went to a revolving restaurant for brunch. What a perfect way to get an overview of the city and the brunch was excellent. Looking down, the first thing we saw was The Plains of Abraham. 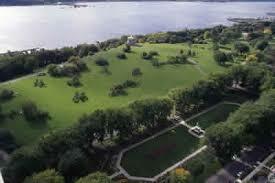 It is now a lush green park with walking paths throughout and huge trees scattered here and there. This was the site of the battle that the English, under the command of Wolfe, and New France, under the command of Montcalm, had for control of the settlement of Quebec. The actual battle only lasted 15 minutes. Both generals died but it was the English that won and established themselves in the New World. In order to keep the French appeased and under threat of a U.S. attack, the English let the French continue to speak French and to keep their Catholic religion, both of which they have kept to this day in the province of Quebec. 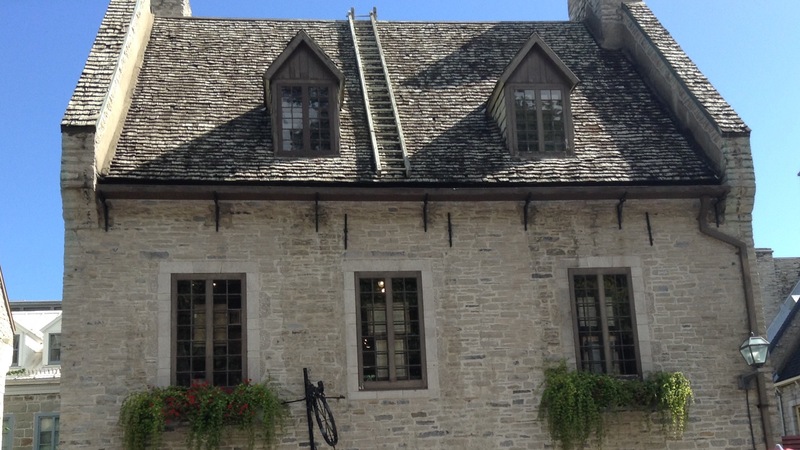 The Château Frontenac was also visible from Ciel (Heaven) as this restaurant is called. It looks like a castle and is set on top of the hill. It is a magnificent hotel with 611 rooms! 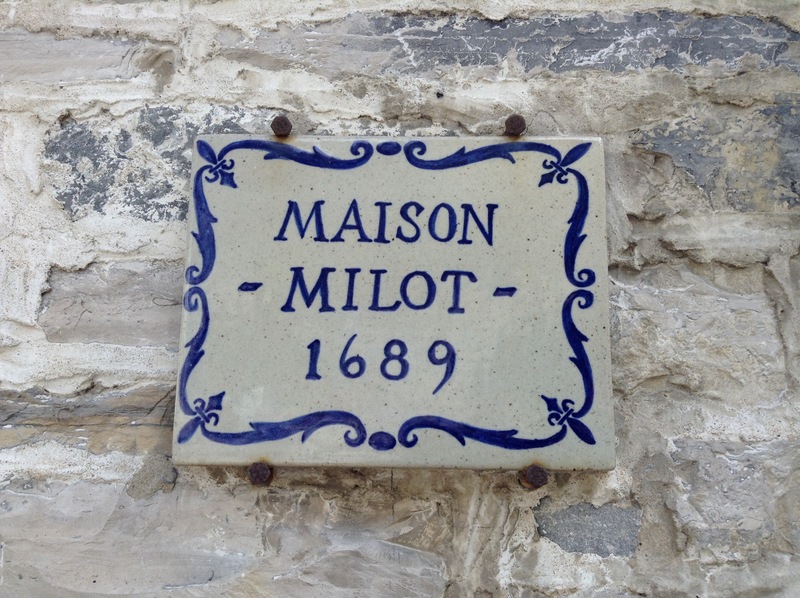 It was built in 1893 and has all that old world charm. Just beautiful! The St. Lawrence river runs in front of both the hotel and the Plains of Abraham. It is full of cargo ships, cruise ships, sail boats, motor boats and seadoos, it is a busy place. Hard to believe this mighty river freezes completely over during the winter, and in times past people could walk to Lévis across from Quebec on the other side. Presently they keep it open with ice breaking ships for marine traffic and a ferry that runs every half hour all year round to Lévis and back. Mid September the weather was perfect for us, sunny most of the time but not too hot. Hard to believe that soon the temperature will drop below zero for the entire 5 months of winter here. We took the Hop on Hop off bus around the entire old town and surrounding areas. So much history, so many gorgeous buildings. It is a very clean city and outdoor café’s are on every street. Flowers grace many windows with their splash of colour against the pale green, grey or white facades and red, green or black roofs. A smorgasbord for the eyes. I love every bit of it. 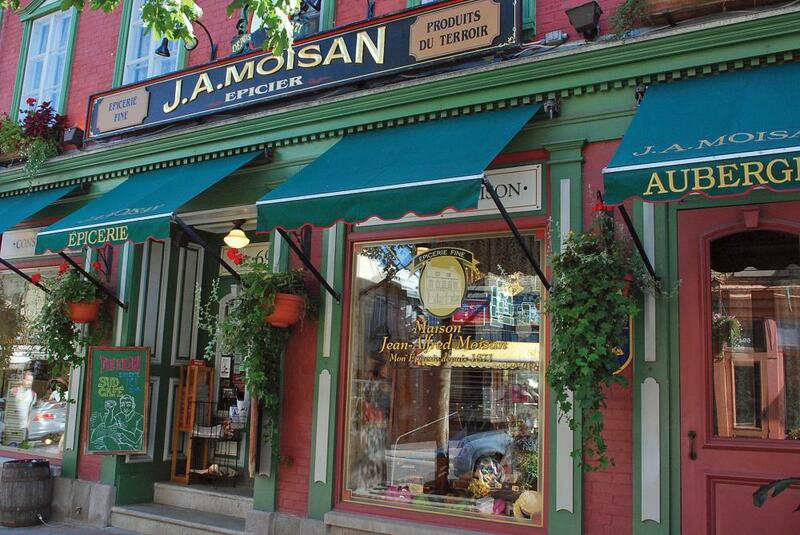 Quebec City is wonderful and is one of the oldest cities in North America. We ate dinner in a restaurant that was built in 1673! Original walls exposed and low ceilings, small staircases to more dining upstairs or bathrooms downstairs. We ate paté, pea soup, tourtière, pickled beets, sugar pie and bread pudding. So good and so French Canadian. 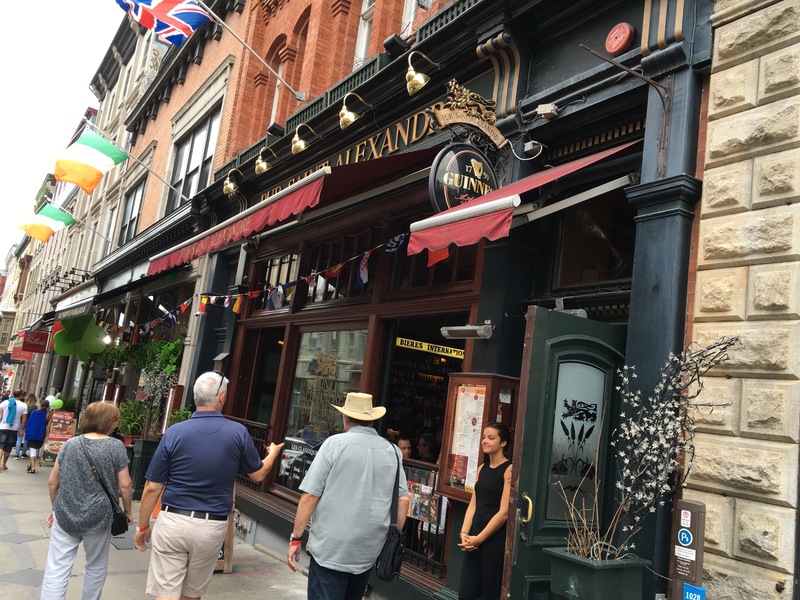 Music filled the air as we meandered around the narrow streets and admired the amazing buildings and cobblestone streets. Every turn was a new picture. The ladder is a permanent part of many buildings because of the number of times needed to climb on the roof and knock the snow off to avoid the roof from collapsing. as well as many old churches. Because attendance is so low in the churches, a number of them have been turned into condos, museums or businesses. 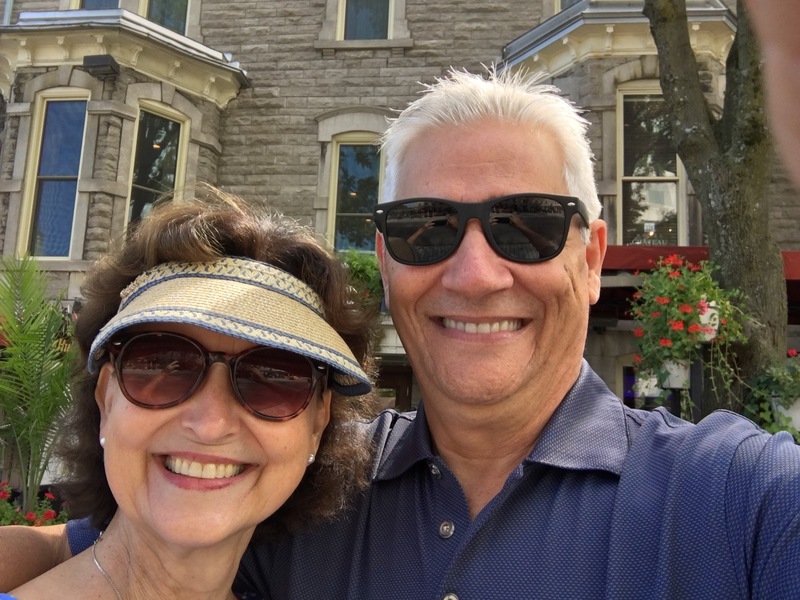 It was raining the entire time that we drove from Ottawa to Quebec City, then after arriving the sun came out and we had two beautiful days. The day we left Quebec to drive back to Toronto it was pouring again. What a blessing to have nice weather. I love reading about your travels, you have a great way of writing mom! 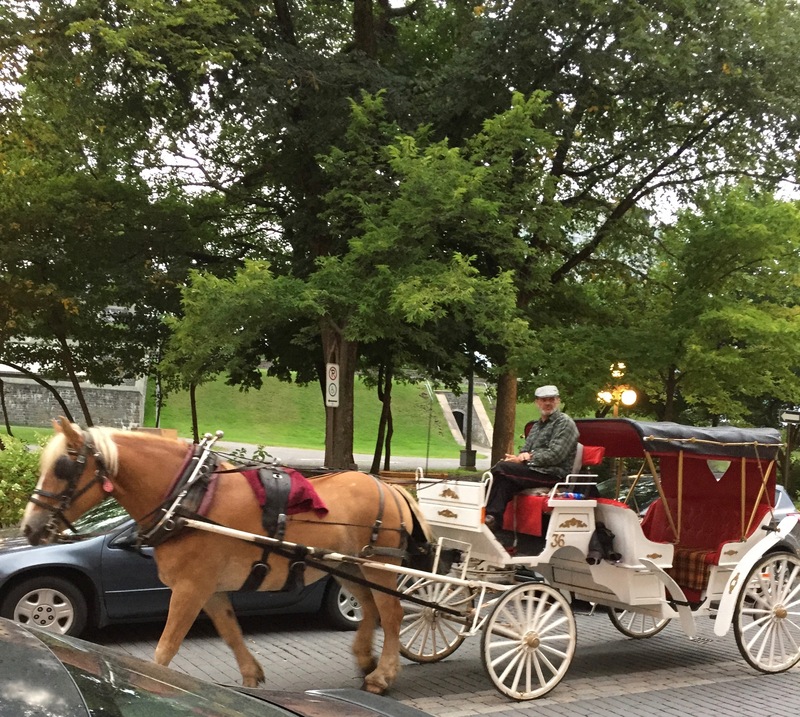 What a beautiful city Quebec is… Your pictures are stunning! Thanks Lisa – hope you can go there one day, it is really special. 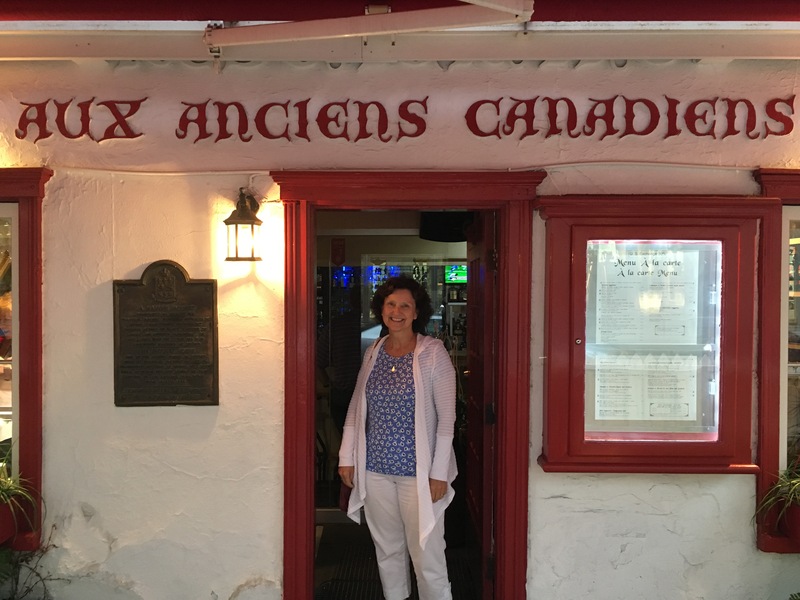 wonderful travelogue of the old city, Jackie ~ well-done! This is wonderful! The history, the scenery, happy for you two!